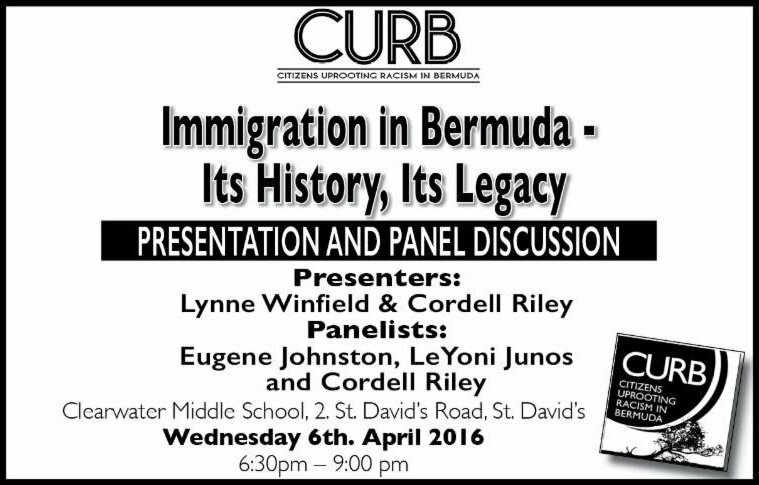 [Updated] Citizens Uprooting Racism In Bermuda [CURB] will be holding a presentation and panel discussion on ‘Immigration in Bermuda: Its History, Its Legacy’ on Wednesday [Apr 6] from 6.30pm to 9.00pm at Clearwater Middle School. Why? We know what they are going to say. That’s not been my experience with the curb presentations I have had to attend. Dicey use and interpretation of statistics by the stats man and slanted agenda from his partner often lacking context and including personal opinion as fact. I suggest they provide a pdf of their presentation to the press. I would be interested in hearing your OBJECTIVE opinion of CURB’s position paper. Panels are only interesting/effective when you have at least one person with an opposing view to allow for a debate. why does this panel of like minded folks also host a debate with those who share a different view? Then we may all learn something. Will the fake hunger striker be there?? Wonder if they speak about West Indian immigration into bermuda at the turn of the 20th century? Or is that considers to be acceptable immigration for some reason? The fact that you take the personal opinions of massively biased people who use their own interpretation of events to satisfy their beliefs as truth, doesn’t make it so. So I ask again was West Indian immigration a detriment to black Bermudians? Do you think they would be against Pathways if the majority were of black West Indian descent? CURB is against Pathways because of the color of the skin of some of the recipients. They have stated that point blank. And that is racist whether you want to cry or not. So why is it called Ireland island? And as an unpleasant truth as it may be with maritime transport the way it was and ‘border control’ being non existent then they came here uninvited and without paperwork but quietly assimilated into local society . Since then , their descendants only one passport away from being ‘expats’ themselves , have continuously directed much energy and hate toward professionals who we desperately needed , and who WERE invited here legally in the 50′s and onwards . The term ‘irony’ does come to mind. some of u just don’t get it do you! What is sad is that with this new immigration policy everyone will be put out and especially the one’s who consider themselves more privileged and educated then others. But oh yea they gave the banks away too so they have no power anyway and power will be transferred to the foreigner lol and oh yea it already has been, cause the whole island is up for sale. The airport is in the works now. Looks like the usual bunch of winners turned up. Incredible to me how many speak on a forum they didn’t bother attending. I live in Hamilton Parish. Did not know the forum was going to happen in the east or I would have waited but I went to the west one and my eyes were opened. And full disclosure, as a White bermudian woman I had no idea that so many of my black bermudian classmates and friends felt this way. I argued that we did not have institutional racism because that is truly what I believed. We have a very painful history here in Bermuda and we will never improve race relations around here if we do not educate ourselves. I have way too many black bermudian friends and coworkers that I love and respect to continue to turn a blind eye. If I have hurt any of them in any way through my previous comments I am sincerely sorry. Government policies aimed at dividing and conquering BERMUDIANS by race should absolutely not be tolerated. I wish I had paid attention before and I am embarrassed that I did not take the time to understand the concerns of my fellow BERMUDIANS on the hill. As I sat in the gym facility at Sandys Middle School, I was in tears. I spoke badly about the strikers. I am ashamed of that. We have two ears with which to listen and only one mouth with which to speak. I’m paying attention now. CURB did an excellent job and I am grateful. I would also encourage you to be mindful of generalizing, stereotyping and jumping to conclusions about a people’s collective experience/feelings ” I had no idea that so many of my black Bermudian classmates and friends felt this way.” If you are genuinely concerned about the experiences/feelings of your friends then I would encourage you to talk to them directly about these and not make assumptions that all of them feel the same way. I disagree completely. I attended their 3rd presentation. It was only after being encouraged numerous times by friends to go that I actually got in my car and went. So my friends, my classmates, my fellow countrymen and women were at those first two meetings. They were also at the third meeting that I attended. I am speaking of so many of MY black Bermudian classmates and MY black Bermudian friends. You don’t have to quote me because I know what I wrote. I know they feel this way because they have tried to explain this to me on a number of different occasions and I simply did not get it. Now I do. Now I get it. I actually had an Oprah lightbulb moment. They talked until they were blue in the face and I still couldn’t and didn’t want to hear them. Until now. I am now on CURB’s mailing list and I received Lynne’s research paper and I know what CURB stands for. You do not have to agree with me, George, but I think they did an excellent job and I am grateful for the growth I know I’ve sustained. I hope they keep going. @ welp…….I wish I could like your post 100 times! I am just sorry it took me so long to start to listen. One thing I can promise. My two children will know better. When you know better, you can do better. I will make a conscious effort to educate them on what I learned last week. It’s never too early to learn about your country. The problem about immigration is the fact that certain favored expat workers get renews their contracts every year without government paying attention to details. These workers stay over 10 year with the intentions to get Bermudian status. Many of these jobs are waitresses, pot washers, chefs, nannies and caregivers. The number of these workers is higher than those in the professional sector but the have no work limit making difficult to Bermudians get a job and overpopulating a tiny island as Bermuda is. The nonsene some people talk. Any statistical information or facts to back up your claims? I won’t hold my breath. Under the plp we saw a record number of work permits issued while international companies were packing up and leaving for greener pastures. Where do you think those permits went? Anything to say on that? And yes they get a descent pay otherwise they’ll be somewhere else, none of these workers gets abused, if so their association would made a call by now. @ Welp I applaud you totally! Please share your sentiments with other white folk as well. We as a community need to all stick together as Bermudians for our children, no matter what race we are, but it is important that during this time we are all on the same page because this immigration policy will hurt all BERMUDIANS going forward and no matter the RACE, but we need to be in this together and not just think that some black people are making noise. Please pay attention for the sake of your children and the generations to come. We need your help too white Bermudians and thank you.